RenuPlex PLUS Itchy Dog and Dog Dry Skin Shampoo is a proven NATURAL remedy to put an end to dog skin problems. 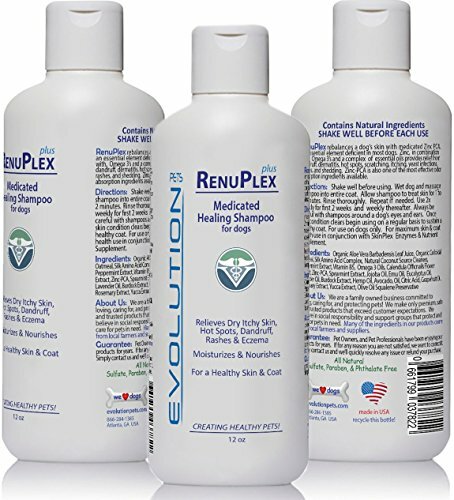 RenuPlex PLUS Medicated Dog Shampoo works to REPAIR and NOURISH damaged skin to include itching, scratching and hot spots with all natural ingredients. Made with only ALL NATURAL and Chemical FREE Ingredients RenuPlex is an AMAZING Itchy Dog Shampoo that also has a great scent! We believe in Natural Remedies and Safe Treatment options for Dogs and RenuPlex Dog Shampoo for Itchy Skin is formulated with all natural healing ingredients to include Aloe Vera, Emu Oil, Peppermint Essential Oil, Zinca-PCA, Calendula, and a host of other great ingredients. Aloe Vera, Vitamin B3, Zinc PCA, Panthenol Extract (vitamin B5 extract), Zinc-PCA, Calendula, Lavender Essential Oil, Tea Tree Essential Oil, Emu Oil, Jojoba Oil, Peppermint Essential oil, Spearmint Essential Oil, and Allantoin. Made in USA. Contains One 12-ounce bottle. 100% Unconditional GUARANTEE or YOUR MONEY BACK - TRY NOW. #1 RATED Itchy Dog & Dog Dry Skin Shampoo for Dogs | INFUSED with Healing Essential Oils, Colloidal Oatmeal & Zinc PCA. You'll LOVE the SCENT! RenuPlex Itchy Dog Shampoo Creates a HEALTHY & BEAUTIFUL Coat! ALL NATURAL, Chemical Free & Safe Medicated Dog Shampoo for Dry Skin. Also a great dandruff shampoo for dogs! If you have any questions about this product by Evolution Pets, contact us by completing and submitting the form below. If you are looking for a specif part number, please include it with your message.